Hope you all had a great vacation. I could not post anything here for last few months, but hopefully I can post something once in a while. 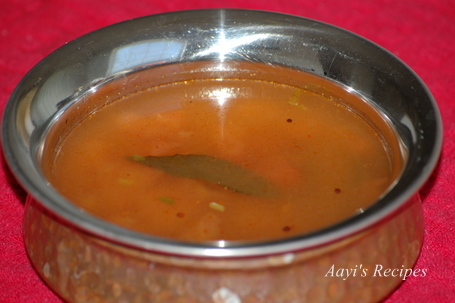 Rasam is very common in South Indian meals. Usually it is very watery and does not have any vegetables like sambar which is thick and has vegetables. Rasams can be made with tomatoes, lemons, peppercorns etc. The powder can be made in advance and saved or made at the time of preparing rasam. Usually for this rasam, only the water used for cooking toor dal is used (dal can be used for some other dish). Since we like to eat it with rice and I add very little toor dal to it. I make it little spicy. It is very suitable for a cold weather and also when you are suffering with a sore throat or runny nose. Dry roast coriander seeds, chana dal, pepper till a nice aroma comes out. Switch off the heat and add chilli powder. Keep mixing taking care not to burn anything. Cool to room temperature and grind to a smooth powder. Store in an air tight container. Pressure cook toor dal in water and mash it very well, add water (or just use 3 cups of water that is used to cook dal and leave out dal). Add tomatoes to the dal water and bring it to boil. Add tamarind, salt. Cook till tomatoes are cooked. Add rasam powder. (If required, add extra chilli powder, as we already have chilli powder in rasam powder, I don’t add it again). Add coriander leaves, take off the heat. Heat a little oil in a small pan and add mustard seeds. When they start popping, add curry leaves, asafortida. Pour this seasoning over rasam. I live in Mexico away from large cities and it is difficult to find many of the ingredients shown. In particular curry leaves probably don’t exist in all of Mexico. Is their a substitute in recipes for curry leaves? Powder perhaps? Leave it out if it is not available. Curry powder is a mixture of spices, not a powder made from curry leaves. its an interesting thing to make and eat and i wish that it will not be much spicy plus delicious to be served with some fruit salad. I learned some of the recipes from the afooddirectory. Looking forward for more recipes. Wonderful. I was looking for a simple tomato rasam recipe. Thanks. Wish you a happy new year Varada aunty, Dont you add jeera for rasam powder?. Rasam with riceis always a satisfying meal. Normally I add pepper, jeera and coriander powder to the rasam. Shall try out this mix too. Looks good. My favorite rasam & I have it in a funny way 😀 cold in a cup. I am going to save this powder recipe. Thanks for this recipie..its simple, easy + delicious! love this rasam…good to sip just as is. will try this soon. Wish you a happy 2010!!!! Will try out this rasam recipe without jeera. One of the most comforting curries/soups.. I love to just have it as a soup..
Thats a nice recipe that u have posted. However I would like to point out that rasam most often is prepared with toor dal…. even normal rasam we do grind toor dal, pepper and jeera and add it…..there’s a lot more to rasam that just a watery treat. i guess i gonna try this tomorrow,thanks for the recipe,..
That is beautiful Mrs. Varada! I’ll be trying your rasam powder… Happy 2010 to you and your family! Your recipes and the overall blog is so wonderful. I always refer to this site when I m out of options for cooking and I always find something interesting. I was wondering if yu can post the recipes for making all the different south indian powder spices – like sambar powder, rasam powder, powders for different rice items like bisibele, puliyogre etc…. All the powders you mentioned are on the site under ‘Pickles and Powders’. I am in gulf….just surfing net to get new recipes for dinner party………..and found Aayi’s site….which resembles with AAI(mother)…..from Maharashtra….. I love rasam,I’ll try to make it.Thanks. Latin name for kadipatta is Murraya koenigii and it grows as happily in Mexico as in India, but it is not used in the cuisine. Go here http:// tinyurl.com/kadipatta (take the space out) and show this picture around and I think you’ll find some quite locally. It doesn’t care for temperatures below 55 F, prefers moist but well drained acidic soil etc but there are several sites that tell you how to grow them; apparently they accept abuse well as long as they have that semitropical sun. They do well from seed, too. Currychef, in NY, is quite the Don of the deal. wow!!!!!!!!! its toooooo simple !!!!!!!!! !